Here’s a powerful children’s book that takes on a very challenging issue: What makes good parenting? Is love enough, or is something else needed? What happens when a parent is not the best one to care for a child, despite the love and good intentions they bring? The story is told through the eyes of a young girl who transforms as the story unfolds, from one who feels life has been unfair, to one who makes a difficult and mature choice. 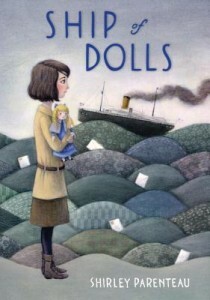 This children’s book is placed in the early 1900’s to include a true historical event about the exchange of dolls between Japan and the United States. The event provides an unusual background for the real significance of the book, which is the expanding awareness of the young girl. We live through Lexie’s eyes as she struggles her grandmother’s moral expectations, and comes to see the love and goodness behind very strict guidelines. Yet the book is not moralistic. Rather, it gives children a chance to grapple with the consequences of their own actions and grow from them. There were multiple instances where I shed tears reading the emotional ups and downs that Lexie went through. Each time she grows in understanding, it’s hard not to cheer her on. In the end, a very intelligent and confident girl emerges. I think 8-year-olds could relate to this children’s book, though in general I’d put it for 9 to 12.